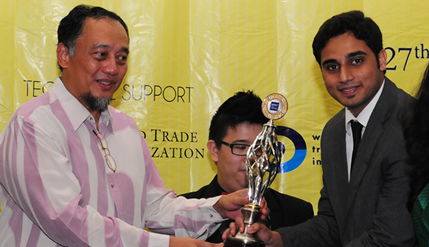 BANGI, 2 March 2014 – A team of law students from West Bengal National University of Juridicial Sciences India emerged overall champions in an international Moot Court competition organised by the European Law Students Association (ELSA) for the Asia-Pacific region. The team from University of International Business and Economics in Beijing China finished second at the conclusion of the 12thElsa Moot Court Competition (EMC2) hosted by The National University of Malaysia (UKM) and the Judicial and Legal Training Institute of Malaysia (ILKAP) here today. A total of 27 teams from universities in 11 countries including Malaysia, South Korea, China, India, Vietnam, Taiwan and Australia took part. This moot court competition is where teams took part in simulated court proceedings, which involves drafting briefs (or memorials) and participating in oral arguments on world trade. The West Bengal university won the first prize with the best team oratory and individual orators in all the four rounds of the contest beginning Feb 27 while the Beijing university team was placed second after its team won the best complainant, best respondent and best written submissions team prizes. The University of Hong Kong was placed third while Bond University of Australia received the Spirit of ELSA award for being the most good-natured team despite the stressful and tough competition. All four teams qualify for the final international level moot court competition to be held in Geneva, Switzerland where they will meet teams from North and South America, Europe and Africa. The prizes were given away by UKM Deputy Vice-chancellor (Academic and International Affairs) Prof Ir Dr Riza AtiqAbdullah O.K. Rahmat; IKLAP Director Lee Lay Choo; UKM Law Faculty Dean Prof Aishah Bidin and ELSA Vice-President (Moot Court) Oda Linneberg Uggen. The head of public relations of EMC2 Malaysia 2014 Lam Kian Yip said this year saw the best response with the 27 teams taking part having to go through three rounds before reaching the final. Sadly, he added, no team from Malaysia qualified for the final. In order to provide law students with an opportunity to gain practical experience in world trade, ELSA organised the international moot court competition with the technical assistance of the World Trade Organisation (WTO). The ELSA Moot Court Competition is a simulated hearing of the WTO dispute settlement system. Interested students from all over the world sent in written submissions for the complainant and respondent of a fictitious case written by a WTO professional. After the written preliminary round, the teams selected needed to present their oral submissions both for the complainant and the respondent in front of a Panel which consists of WTO and trade law experts.